Those planning to drive to Disney World for their vacation will want to know how much to expect to pay for things like resort and theme park parking. These costs can really add up, so do your home work on the fees and use our Disney World Parking Tips so you don’t lose your car in the parking lot! When it comes to considering the costs for a Disney Vacation, many people forget to factor in things like Disney World Parking fees. 2018 marked the first year that Disney World has ever charged resort guests to park. This means that no only will you pay for your resort stay, if you choose to drive yourself to Walt Disney World in Orlando, you will also have to pay a fee to leave your car in the parking lot of a resort. The amount charged for a parking fee will depend on the Disney Resort you choose. I am having breakfast at a Disney Resort, but not staying there. Do I have to pay to park? No, complimentary standard self-parking is available while enjoying select dining, shopping, entertainment, and recreation experiences at the Disney Resort hotels. While Disney World does provide complimentary bus transportation to resort guests, some people just prefer the flexibility of driving their own vehicles. If you are staying at a Disney Resort, you will NOT have to pay to park in the Disney World parks. Just allow them to scan your MagicBand to verify you are staying at a Disney resort. If you are NOT staying on Disney Resort property, you have no choice but to pay park at the Disney World parks. Parking is FREE for Disney Resort Guests and Annual Passholders. Disney World guest only pay one fee for a parking. The pass is good all day at all 4 theme parks—Magic Kingdom park, Epcot, Disney’s Hollywood Studios and Disney’s Animal Kingdom. There are ChargePoint charging stations located in the parking lots at Magic Kingdom park, Epcot, Disney’s Animal Kingdom as well as in Disney Springs. Arriving Guests may ask a Cast Member for directions to these charge ports, which are available on a first-come, first-served basis. To use the charging stations, you will need a credit card or a pre-ordered ChargePoint card. The cost to charge at these stations is $0.35 per kilowatt hour, with a minimum service amount of $1.50. Charging will stop once the vehicle’s battery is fully charged. 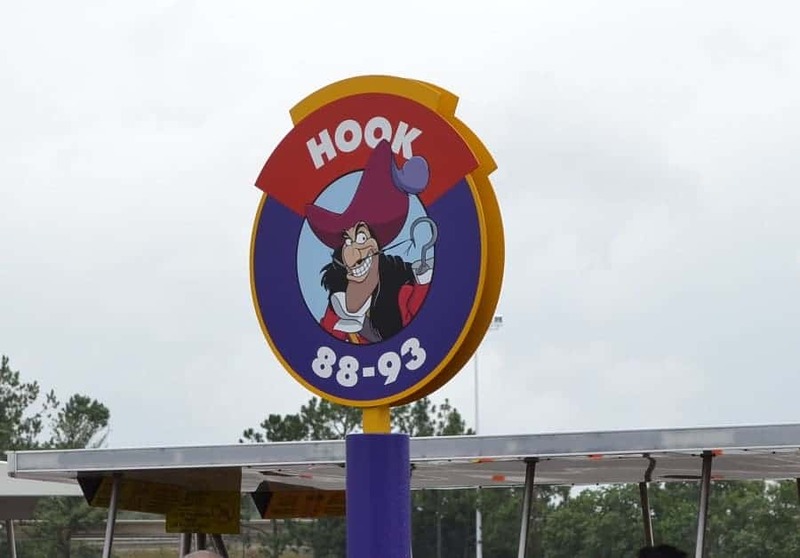 How many times have you parked the car at a theme park only to forget in what section you left it? It has happened to me way too often. Usually we know what section it is in, but forget the exact row. That can be a huge problem when there are 50+ rows in a section. You can wind up roaming aimlessly through sections of cars before spotting yours. This can be super frustrating when you are hot & tired from a long day at the park! Did you know that there are over 12,000 parking spaces in Magic Kingdom alone! That means that if you forget where you parked your car, you could be in BIG trouble. Magic Kingdom is divided into 2 sections, Heroes & Villains. Be sure you know which one you are in because if you end up on the wrong tram you will NEVER find your car. Instead, you will be taken on a very long and boring ride through the parking lot only to end up where you started. So, how can you be sure to locate your car in a Disney Theme Park? Use your cell phone to take a picture of your section and row marker. You will find signs like the one above in each parking section. To know the precise row number, look at the pavement closest to the tram station. You will find them painted on the pavement. If you don’t use our parking tip for Disney and you have no idea where you parked your car, you will want to go back where you got off the tram. At some point another tram will arrive and you will want to let a cast member know that you’ve lost your car. Someone will come by to help you locate it without you having to walk through the parking lot row by row. Do you have any tips for parking at Disney World?